Google’s similar sites is a great Extension to your Chrome browser. It helps you find relevant info through Google’s Similar Pages. If you find an exceptional web page, you may want to view similar pages. Maybe you are researching a particular topic or simply browsing. Adding Google’s Similar Pages to your Chrome browser provides you a quick way to find related pages as well as more relevant content. All this, with just a click on the icon that will reside in your URL bar. Here is an example. 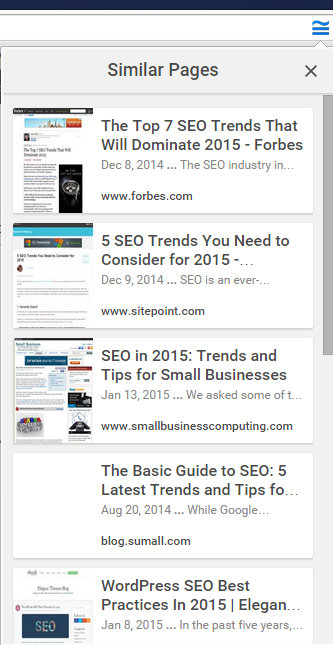 Say, I’m reading an article called SEO Best Practices and Trends for 2015. Then I want to read more info on the same topic. I have some options. I can return to my search engine results page (SERP). I can do a new search or look for videos on Youtube. Alternatively, I can browse around the domain, or I can hit the similar pages icon. Some of the benefits of continuing your search this way are clearly visible. You get a web page image preview, a publication date, description, and the title. I like how ads aren’t in the way here. Interestingly, this extension helps find pages I might not find on the SERP. When researching a product, let’s say the Intuous touch and pen tablet, I can quickly jump to other relevant reviews. I will start with a google search and select a recent listing. If you are following along, notice if they are reviewing the most recent model. When I hit the similar web icon I can tell which similar pages are discussing the same model, thanks to the image preview/ title preview. Additionally, this can save you the annoyance of landing on terrible web pages that look like the 90s. You know about the International Movie Database a.k.a. IMDB, or at least now you do. After a quick “similar sites” search, I know about about: Ask.Metafilter, FilmCrave, AllMovie, Filmsite, iMovieName. A google search may not reveal these. This extension is comparable but different. Similar Group, the ones behind SimilarWeb and SimilarTech have an even better version called Similar Sites Pro. There have been complaints in the reviews about ad placement and malware so be sure to set up Adblock Plus before setting up the similar sites pro extension. Each similar page recommendation now comes with metrics. You get the SimilarWeb Global and Country Rank. You get the Category Name and Rank. When I compared the two extensions, I noticed one prominent difference. Similar Pages is just what it says; it gives you similar web pages. Similar Sites provides the relevant top level domains whether you are on a homepage or specific article on a blog site. In other words, similar web ignores the individual page and only looks at the site as a whole. Overall, both of these tools have their time and place, and I hope that they will help you get the info you need faster.